Our trip to Uganda in February – our first – was on a whim; we’d been invited to a wedding in South Africa and decided to delay our return by a couple of weeks’ holiday in Uganda. And it was a happy experience. It is no surprise that British colonialists so favoured Uganda; although it lies on the equator, the climate is not extreme as the average altitude is more than 3,500 feet above sea level. 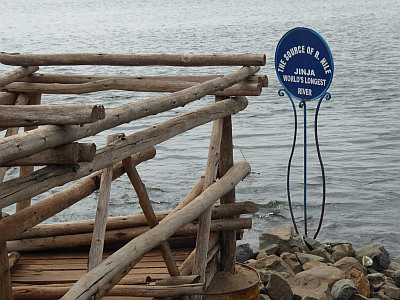 Uganda borders Lake Victoria and the second largest town is Jinja, which declares itself to be the source of the Nile. It was in reporting a trip up the Nile in 1907 that the young Winston Churchill famously declared Uganda to be the Pearl of Africa. And in places Uganda appears as the best of an English summer’s day. But driving from Entebbe Airport to Kampala is an immediate introduction to the dreadful local traffic conditions. It is only 20 km but it took us 1½ hours on a weekday afternoon. (The return trip on a Sunday afternoon took us only an hour). More rapid transport is available as a pillion passenger on the back of a motor-bike (the boda-boda) if you want to take your life into your hands, and interestingly Uber has just launched in Kampala. Uganda as we know has had an unhappy recent past, coloured by the brutality of the Idi Amin regime. But it is now a very safe country. My wife and I separately wandered around Kampala and felt no sense of threat. Although crime is only moderate, corruption in Uganda is high, and it starts at the top. Although Uganda is a parliamentary democracy, of late opposition has been steadily eliminated or discredited, and the judiciary suborned by political appointees, allowing the ruling elite to enrich themselves. In Uganda the corruption is manifest in funds not reaching the projects for which they are intended. For example, many of the roads are in a poor state of repair, full of potholes. And no wonder! We saw a new road under construction; the Chinese contractors (there is a big Chinese presence in Uganda) simply compress the soil and then cover it with tarmac. The heavy rains in Uganda quickly leach away the underpinning earth and the road is eroded. "Not enough money,” came the reply. “And of course, someone benefits from the need for continual repair.” So some of the roads are truly awful, full of potholes. Be prepared for a bone-shaking ride if you travel into the countryside. Which of course you should if you visit Uganda. Tourism is now a major contributor to GDP, most travellers coming from elsewhere in Africa, but now more than 40,000 a year coming from the UK. Wildlife is a big attraction; for us seeing the mountain gorillas was a highlight. 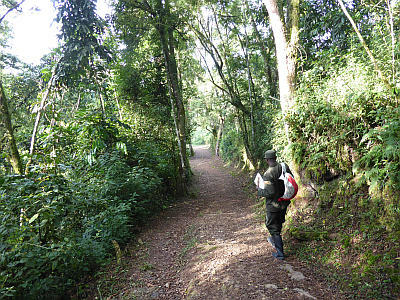 (However, I had overlooked that these were mountain gorillas, and to get to them – wherever they are on a particular day – requires a fairly arduous trek of some hours. I was equipped with a pair of the worst shoes that money can buy for this, and was able to complete the climb over very muddy terrain only with the help of our guide). Uganda was once called the market garden of Africa; agriculture is big; travelling to the southwest there are vast tea plantations and the ground is very fertile. And it is government policy to keep the labour force on the land and avoid the trend to urbanisation, because of the population profile of the country; 50% are under age 15 and there isn’t work available in towns for them. So most of the work of farming is done by hand; mechanisation is slow to take hold. Uganda has been stricken by AIDS; there are many AIDS widows and there is still a stigma attached to anyone who is HIV positive. We have long been supporters of Action Aid, a charity active in Uganda and they took us to see a couple of their projects aimed at helping this situation. One such provides employment for women who make clothing, toys and other domestic items. The project also provides schooling for children who are HIV positive and who otherwise might find it difficult to be educated. 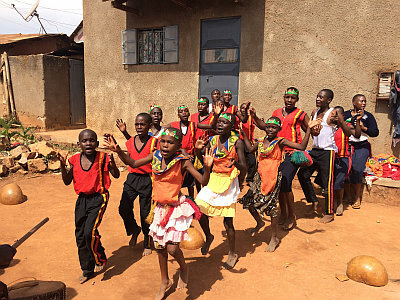 The children entertained us with some traditional dances, and little playlets intended to address the negative perceptions of those who are HIV positive. Afterwards I asked them what their favourite school subjects were; to my surprise a couple of teenagers responded – physics! Across the road was another project. Organic waste, such as plantain skins, is collected from around the neighbourhood, dried in the sun, reduced to charcoal in an incinerator, and then fashioned into briquettes that are then sold. Action Aid has a fine history in Uganda in helping people to help themselves; they support projects as well as having those of their own. They are not politically active, but do invest in helping the weak to understand their rights and to stand up for them. You would have thought that the legacy of colonial rule would have left some impressive buildings in Kampala; but there is little there to interest the tourist. They do however have a regular cultural show in Kampala – drumming and dancing. I was particularly impressed with the drummers, who march with the drums on their heads and as well as beating them with sticks are able also to strike them above their heads with a high kick. A colonial legacy is the English language, which is widely spoken, and public signs are in English. A further legacy is Christianity; I ran a one-day training programme for a local consulting firm, which concluded in prayer. It is common to say grace before a meal. Other British habits were not present, however; we saw very little litter, hardly anybody smoked, and there was little evidence of pets. I know that others in the Company have visited Uganda, but as yet it is not a popular tourist destination from the UK; but it is well worth a visit.